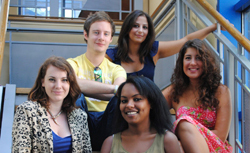 Each year the University's students elect a team of Student Officers who work within Reading University Student's Union (RUSU) to represent the student body throughout the following academic year. This year's Student Officers have been working hard since their term of office began in June/July, in preparation for the challenging year that lies ahead. President, Jess Lazarczyk, is responsible for the development of the Union, community and communication. "This year I am keen to maintain the existing positive working relationship between the Union and University, to raise awareness of the positive work students undertake within the Reading community by developing the Community Rep scheme, and to develop the Safety Bus on campus to ensure that students can study and get home safely."